They say that the longest journey begins with the first step. I took my first step into the world of electronic music production way back in college, getting to understand this obscure new software a friend turned me on to called Ableton Live, but it wasn’t until 2010 that I made my way into the wider world of audio hardware, MIDI controllers, and analog synthesizers, permanently cementing my interest in making music as well as cementing my account status on PayPal as “platinum elite”. I’ve acquired a fair amount of gear in my little ever-changing home studio. Over the years I’ve churned through even more hardware trying to figure out what works best for me creatively and what sounds the best to me sonically. Setting up, sampling, rewiring, and (let’s face it) eventually selling most of this hardware has taught me a thing or two about what synths and hardware make the most sense for my needs, and as a fringe benefit, has helped me understand how to keep my studio agile and intuitive. Reflecting back on where I was in 2010 verses where I am today, a lot of this wisdom is beginning to crystallize. Though everyone’s needs and desires with producing music will be different, there are some very basic ways to inform your approach to the journey ahead. There really is no substitute true hands-on experience when it comes to selecting your next synthesizer, listening to as many demos on YouTube and SoundCloud as possible is a start, but until Sweetwater brings around a mobile showroom containing every modern and vintage keyboard for you to test out, reading some solid advice is your next best alternative. It’s easy to ask but this will probably be one of the more difficult questions for you to answer. What exactly is your goal in all of this music stuff? At this point it’s likely something you simply want to make a hobby of, having been inspired by the music you enjoy or a particular artist you’ve just gotten into. “I just want to screw around and make noise” is a perfectly acceptable answer to this question, but that makes it a little harder to pinpoint what would be best suited as your first synthesizer purchase(s). Looking back on it, this was something I wish I had clarified with myself way back when. I was in the “just have fun” camp too with no clear goal or outcome in mind, a Roland MC-505 Groovebox was my first synth purchase (if you can call it that since the Grooveboxes are actually ROMplers), and while playing around certainly helped me eventually recognize the direction I wanted to take, it also made me feel as though asking one or two questions in the beginning would have helped me get to where I was going but in half the time. It might be tempting to go out and drop thousands of dollars on the first vintage polysynth you can get your hands on, but will you really end up being inspired by it? Sure, part of fun in this entire journey is getting to lay your hands on and muck about with various synths and other instruments, figuring out which features and sound are right for you, but at a certain point you should feel driven to put together some tracks with your gear of choice. Playing around for the sake of playing around in lieu of creating something larger will get tiring after a while, and when you look back on it, you’ll wish you had more to show for your time and effort. What kind of music do you like listening to? What artists and bands inspire you? What sort of sounds do they tend to use in a track? What musical ideas do you find compelling? Are you planning to work with a DAW and arrange music on a computer or do you prefer to jam live and use a mixer? What instruments would you end up with if you pulled apart each sound on a track you like (bass, drums, guitar, keys, pads, effects, etc)? Do the types of music you enjoy rely more on rhythm or melody? Give yourself the opportunity to think over these types of questions before you start to shop, you may find that the kind of gear you had dreamt of buying may now be in stark contrast to the kind of gear you would actually find useful in the studio. Read interviews with other musicians and learn about how their gear choices and production workflows evolved over time. You might be surprised to learn just how many other artists didn’t realize a damn thing about how to utilize their gear and went through many phases before settling on what synths worked for them and what sound they really enjoyed producing. Thinking even the slightest bit about what you want to accomplish with your music before you start getting invest will help save both time and money from the onset. It will help clarify more than any amount of synth noodling can ever teach you, but more importantly, it will allow you to take your first steps of this journey with purpose and confidence. As I mentioned above, my very first piece of music gear was a junky old Roland MC-505 with a busted LCD screen that I bought off a friend from work. I loved that thing to bits, it was quintessentially fun to program, very immediate to interface with, and didn’t sound half bad either (if 90s techno is your thing). Even if I was just making some cheesy dance loops, the experience of using the Groovebox was exciting and enjoyable. But eventually, after getting frustrated at the limited palette of sounds the MC-505 offered, I brushed this fun little box aside in favor of its bigger and more complicated brother, the Roland MC-909. At the time it seemed like the right move, the MC-909 offered vastly more features such sampling, more sequencing tracks, more effects, a bigger screen, a killer arpeggiator, sound card expandability, and the like, but looking back on it selling my MC-505 so I could finance an MC-909 was one of my biggest regrets early on into my journey. It’s not that the MC-909 was a bad instrument, it certainly opened my studio up to more possibilities with very few instruments, but in the end it just wasn’t as fun as my MC-505. My thinking at the time was, “well, they’re both Grooveboxes and 909 is a bigger number than 505, so it must be better, right?”. As it turns out, bigger isn’t always better, and as much as I tried to enjoy my time with the MC-909 the workflow just felt clunkier and less of a joy to use, not to mention the sounds were thinner and more oriented towards pop and R&B, not techno. This simple fact didn’t occur to me at the time, but my Groovebox experience taught me that although all these synthesizers are used toward the same ends (making sound) each and every one of these instruments are unique from both a sonic and workflow perspective. I jived with the MC-505 and not the MC-909 because the 505’s way of doing things made more sense to my brain and the results it produced sounded better to my ears. Though there are an almost infinite amount of other synthesizers and drum machines out there, both as hardware and software, you shouldn’t overlook a particular piece of gear just because there’s something better in the marketplace. 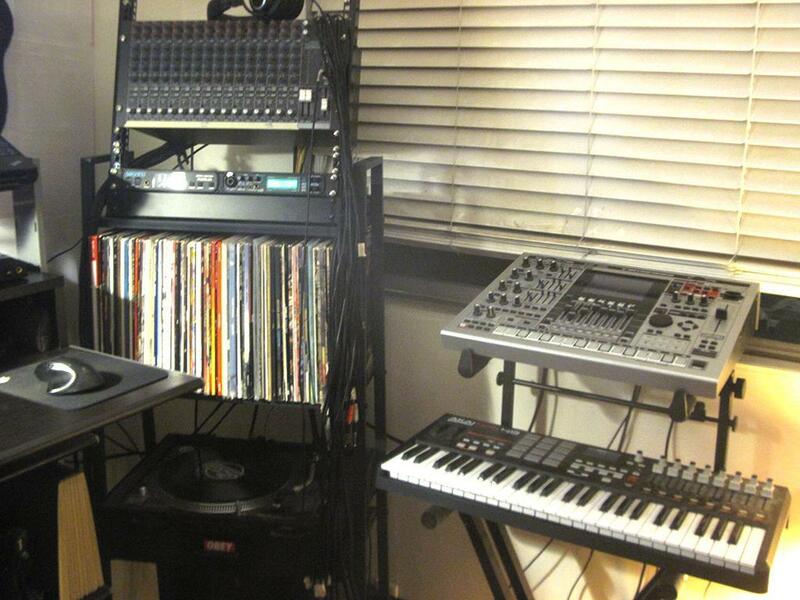 If your goal is to produce music then it is important to stick by equipment that helps you achieve that goal. Becoming more familiar with a single piece of gear rather than bouncing from one synth to another will also help you achieve deeper results as you learn about every little quirk and feature of that instrument. Take care of the hardware you connect with the most, not every piece of gear will be as immediate or fun. Similar to point #2, it never hurts to explore and try out new instruments or new production techniques, but if you discover some creative method or workflow or combination of hardware inspires you in a particular way, take note of that setup and apply it to your work in as many ways as possible as opposed to rearranging your gear and starting over from scratch. Never undervalue the immediacy of a setup you work well with, not only will it allow you to channel your creative energies more easily but that setup is also physically available to you during those times when you do get inspired to create. When I look back on the times I’ve had a higher than average creative output I can remember it was during a time when I had a simple but effective group of machines in front of me that required very little overhead or hassle to operate. This isn’t particularly a problem when you only have a few pieces of gear to choose from, but it’s tempting to want to reconfigure a setup and see what other results can be achieved after only noodling around on your hardware for a short while. My message to you: if the way you set things up felt fun and inspiring, just walk away for a little bit and come back to it when you feel the urge to play again. Resist the temptation to immediately retool until you’ve had enough time to dive deeper into a process that works for you. Otherwise you’ll spend more time rewiring your gear together than you will using that gear, and this will lead to frustration and burnout rather than creative results. This applies to your studio setup as well as what you do with an individual instrument, but in many cases with your work, less is more. Getting to know a few pieces of gear intimately will take you much further in discovering your sound than having a fully kitted out recording studio at your fingertips. Once you get a little further along on your journey and better understand your needs as a musician it’s a bit more realistic to start investing in other hardware for your studio (mastering gear, mixers, MIDI interfaces, patchbays, etc), but when you’re just getting started it would be wise to not overcomplicate your setup. The same can also be said for the sounds you might end up making with your new found toys ahem instruments. It will be tempting when you sit down with a real synthesizer to want to adjust every knob and parameter at your disposal, shaping even the slightest contours of each patch, but the truth is if you end up exhausting every option available on a single patch your sounds will begin to take on a mushy noise quality rather than a distinctive synthesizer sound. Just because you have 3 LFOs and 3 envelopes at your disposal doesn’t mean you need to use all of them at the same time! As synth manufacturers produce bigger and better instruments every year with greater numbers of features and functions the amount of complexity in an individual instrument increases. Complexity isn’t a bad thing, but it can be very easy to get off track in the name of exploring new and weird sounds when you initially just wanted to create a cool bass patch. There is nothing inherently wrong with adding layers of complexity to your sound, but complexity doesn’t necessarily equate to better sounding results, and more importantly, viewing the art of synthesis as a complicated puzzle which requires setting every parameter of a patch with painstaking precision takes us away from the fun of actually building a track and creating music. Resist the urge to tweak every parameter of a particular sound and instead focus on tweaking or adding complexity to the right parameters for the kind of sound you’re working with (any kind of pulsewidth modulation goes a long way on a square wave, for example). Tweak hard but tweak sparingly, this will save you both time and creative energy, leaving you with more time to record the results of your sonic explorations. There’s no shortage of information on the internet regarding questions such as “how do I make my synthesizer sound like X?” or “What gear did artist Y use to make this track?”. Whether it’s an explainer video on YouTube, an article, a forum post, a published book (Welsh’s Synthesizer Cookbook is a good place to start), or diving into a synth preset, absorbing as much of this information as possible on the how’s and why’s of creating particular sounds will push you forward in your understanding of synthesis. And from a gear perspective, understanding what features of a synthesizer contribute to producing the sounds you want to make will help you narrow down the types of hardware worth investing in for your production needs. Your eyes can only take you so far when trying to understand and apply concepts in the audio realm however. For as much as you can learn from a quality tutorial or instructor, knowledge is no substitute for a pair of well trained ears. Your art and your product will ultimately be communicated through this part of the body so, while obvious, it is crucial to always trust what you’re hearing and evaluate whether or not it sounds good to you, even if you’ve followed a particular tutorial to a T.
If it sounds good to others but it doesn’t sound good to you, it doesn’t sound good and it’s not worth using in your work. Do your oscillators sound slightly out of tune? Close your eyes, adjust their tuning, and stop when you hear the result you perceive as “correct”. Always be willing to explore new possibilities and seek out new sounds, but at the end of the day you are ultimately the judge of what sounds right and what does not. Use your powers accordingly. Piggybacking slightly off of point #5, trust your ears more than your eyes, especially when it comes to the age old debate among the synth community regarding analog hardware vs more modern digital hardware. Synth nerds could go on for days about this kind of thing, you may very well form an opinion on the subject yourself, but the only thing you really need to know about this debate is “the only thing that matters is what sounds good to you”. Analog synthesizers are where it all started and many classic synth sounds come from this tradition, it was of course the only hardware capable of producing these sounds at the time! Analog instruments are also individually unique in their sound by nature of their construction. Their technical imprecisions and variability in their components produce mysteriously pleasant results on to themselves (oscillator drift is one example of this imprecision). It is rumored that no two Roland TB-303s sound exactly the same, an unintentional phenomenon produced by the use of cheap electronic components that the instrument has become revered for. Digital synthesizers on the other hand are the definition of precise sound. Microprocessors produce much more predictable and accurate results, the do exactly what you tell them to do after all. While some might argue that digital synths “lack the soul” of analog machines, I’d argue that they make up for this shortcoming by being infinitely more complex, flexible, maintainable, and less expensive than their analog bretherine. Judging an instrument based solely on its innards distracts from the real reason we enjoy playing around with synths. In the end, it’s only what they sound like that matters. I bring up this analog vs digital debate not to give my own opinions on the subject but to illustrate that it’s not necessarily worth your time to disregard a synthesizer just because it “lacks analog soul”. In fact, I wish I had been more aware of the benefits that digital synths offered early on into my own explorations. I had played around with a few digital instruments on the cheaper end of the spectrum when I was looking to buy my first real keyboard synth, ultimately I purchased a Novation X-Station 49. The X-Station was an alright instrument, it had a lot of the features I was looking for, but the sound left much to be desired. For a while this turned me off to digital synthesizers, but what I didn’t quite understand at the time was that the X-Station was just a ho-hum instrument, it wasn’t a reflection necessarily on digital technology. And I wish I had been aware of the benefits early on because it could have saved me a lot of money and time. Years later I can firmly say that some of my favorite hardware synthesizers are “virtual analogs”, that is, digital synths which aim to replicate traditional analog instruments, and for the longest time I had dismissed VA synths as less capable imitations of classic hardware. While it’s true that virtual analogs are nothing more than software interfaces housed in a metal box that has not stopped me from embracing all of the fantastic sounds and possibilities I get out of my Nord Lead 2 Rack and Alesis Ion. But even more fortunately for the novice synthesist on a tight budget, you don’t even need physical hardware to get the digital synth or virtual analog experience. Tens of thousands of “soft synths” and VSTs exist, many of which are free or quite affordable and can be run on even the most basic computer hardware (and as an added bonus, take up zero space in your bedroom studio). I also passed these programs over early on into my synth adventures thinking they were nothing more than cheap toys, but VSTs such as Synleth1, Reason, Aalto, and pretty much anything made by TAL, u-he, or D16 have become indispensable tools in the studio that sound great and are fun to work with. I still love my Roland SH-101 for fat analog bass and lead sounds (and acid! 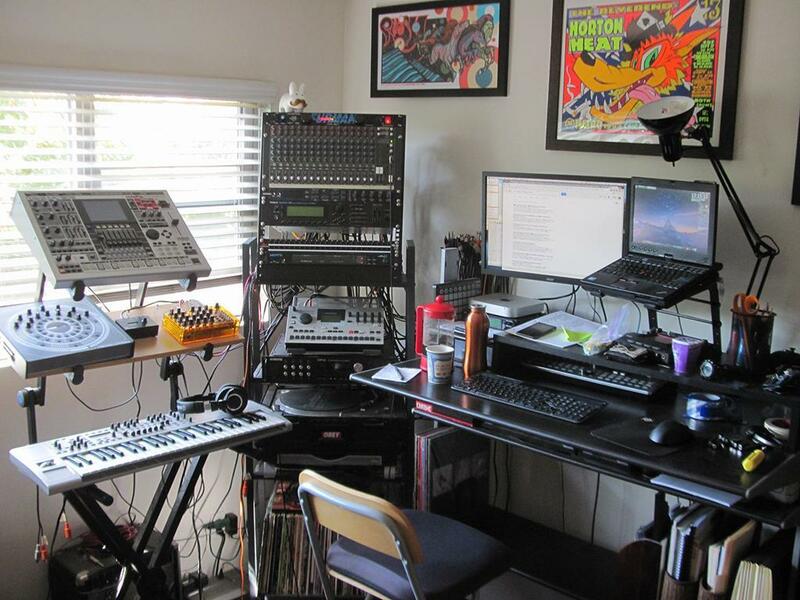 ), but for me both analog as well as virtual analogs get just as much use in my studio. They just sound good to my ears, what else can I say? This is something I still struggle with in my studio. 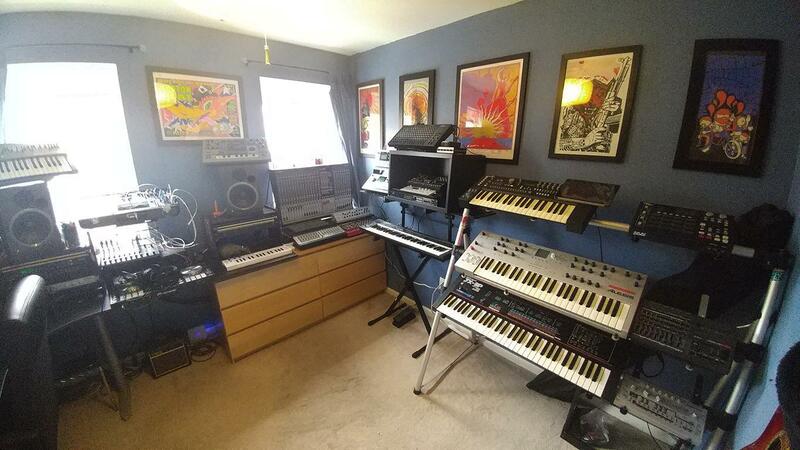 With so many options out there and so much hardware, both new and rare, to choose from, a home studio can very quickly start to turn into a synth museum. I say a museum because you might end up with quite a bit of gear, but more so a lot of that gear will merely sit around on display collecting dust. As we discussed above, every instrument is unique and holds a special place for us sonically. You may eventually end up with a couple of instruments that overlap in functionality and sound, this will simply be a consequence of trying out a variety of hardware over the course of your synth explorations and deciding you really like a few of them, but as your collection grows so will the complexity of your studio, and this added complexity, if not managed well, can lead to a drop in productivity with making music. Given this, it would be wise to keep your studio setup slightly slim in an effort to keep yourself focused on the goal at hand. Part of this means forgoing any devices which might duplicate the function and duties of another instrument you already own, but more so, I would advise indulging yourself with the purchase of one or two extremely good synthesizers early on. Good doesn’t necessarily mean pricy, but many of the great pieces of hardware currently available will run a little expensive. I would have balked at this advice early on simply because I could never have afforded to drop $1,400 on a machine like the Dave Smith Instruments Tempest or Moog Sub 37, but honestly the quality of such instruments and the amount of possibilities they provide would have kept me very satisfied as a beginner, and if I took into account the amount of money I spent across my first 3 or 4 synth purchases, suddenly a +$1,000 piece of gear doesn’t seem so ridiculous. But there really is something to be said for owning a fantastic sounding instrument. Sound is probably the penultimate quality that you’ll constantly be questioning among any synthesizer you own. It’s true that you can squeeze fantastic sounds out of almost any synth given enough post-processing and polish in the studio, but being able to achieve such wide and expansive sounds from your starting point, the synthesizer itself, will go a long way in keeping you focused and inspired in the studio instead of longing for that next gear purchase that would really tie your sound together. And if it hasn’t come through in any of the other above points, you really should consider all the advantages of keeping your studio collection tight and simple. Be it a pro or a con, if you do end up with three or four incredibly powerful (and expensive) synths you will certainly be able to cover a lot of ground with only those instruments while having very little additional money to spend among other synthesizer purchases. Think of it as reverse budgeting, but in all honesty, it’s way more satisfying to become intimately familiar with a small collection of hardware than to spread yourself thin over dozens of instruments and having to continually learn the ins and outs of each. Less is more, and while less may also be more expensive, the simplicity of your studio will be sublime. 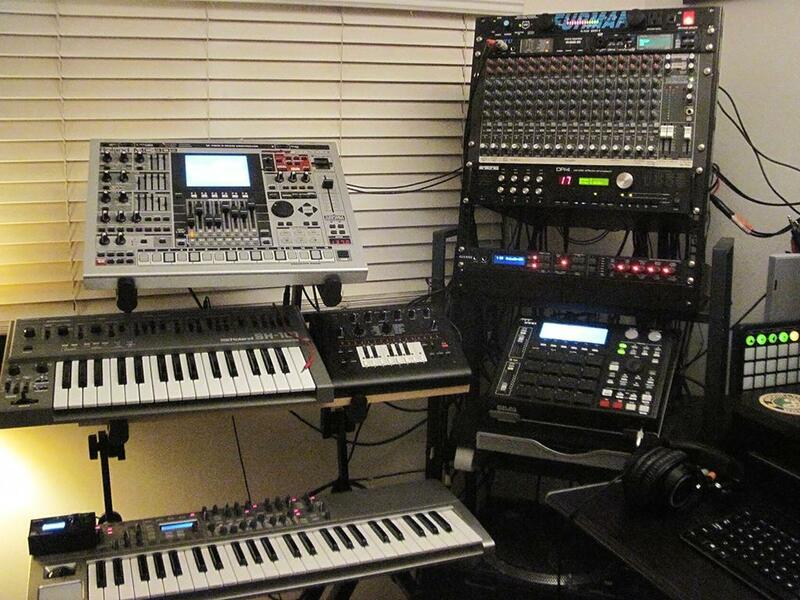 Your synth is only a small piece of a bigger ecosystem. Without getting too bogged down talking about building a complete home studio, you’ll need a lot of cables and other odds and ends to connect your various bits of hardware together. Predictably, you will have a mixer to mix your songs together, but to do so will require a couple of different audio cables. To synchronize your instruments and send control and note information, MIDI cables are necessary. Want to add an effects unit? More audio cables! Have any samplers? They probably take an SD card or Compact Flash to store and transfer sounds. Need to replace a power adapter? Trust me, at some you will. The more specialized your hardware the more potential there is for needing to add another unique bit of miscellany to your gear collection. Having all the right odds and ends on hand will go a long way in keeping your growing studio capable and allow you to pursue your workflow uninterrupted. Resist the urge to skimp on both price and length of the cable since there’s nothing worse than having to troubleshoot a dead signal in the back of a patchbay or to stretch a cable so tightly that you can pluck it like a guitar string. Monoprice makes some fantastic quality cables at reasonable prices, I’d recommend them for any balanced applications, especially for mixers or audio interfaces. Hosa is a fine manufacturer as well, about 80% of my audio spaghetti comes from them. Another way to stretch your dollar further while adding flexibility to your studio is to invest in an assortment of cable adapters and dongles which will help account for any oddball devices that might end up in your stable. My Roland D2 uses RCA outs, for example, and in fact many of Roland and Korg’s newer noise makers use ⅛” stereo jacks. Sometimes you might need a male XLR cable when only female XLR is available. Need to split a mono channel into a stereo signal? There’s an adapter for that. Keeping an array of these handy converters will go a long way in keeping your studio agile while cutting down on the cost of buying yet another cable. At a certain point you might even begin to look into more studio-oriented conveniences like power conditioners, patch bays, MIDI routers, and other devices. All these odds and ends will add up over the course of your hobby, but it’s better to make the accomodation ahead of time instead of being stuck waiting for a cable to get delivered so you can hook that one final piece into your setup. To echo some sentiments above, you don’t necessarily need to buy a piece of analog hardware to get started with making music or even to play around with synthesis. The computer, laptop, tablet, or even iPhone you’re currently reading this on is fully capable of running software and other apps that can do all sorts of musically advantageous things. But to take that idea one step further, it’s quite possible you don’t need to invest in that sequencer, arpeggiator, eurorack module, MIDI controller, drum machine, or even effects unit immediately to compliment that one piece of audio hardware you own. If you do happen to have a USB to MIDI box or even an audio interface with MIDI I/O you have everything you need to bring your synthesizer into the computer-assisted realm of audio production, but even the lowliest of iPads, enhanced by the correct Apple-approved MIDI or USB dongle will open your studio up to numerous and inspiring software possibilities. And for all my Android friends out there, you don’t even need to invest in a dongle as long as you have USB connectivity on your device. And even more conveniently, you can use the headphone jack on these devices to both record music (for manipulation inside the tablet) and to generate clock, gates, and trigger signals for any modular or semi-modular gear you might have on hand. A couple of apps to consider for sequencing and MIDI integration on the iPad include Cubasis, Genome, Fugue Machine, Patterning, and Lemur. For Android, I’d recommend browsing the blog over at Musical Android to get an idea of some of the great apps available on non-iOS devices. I’d also be doing a disservice if I didn’t mention Sunvox, Caustic, and Moog’s Model 15 synth apps, available on both Android and iOS. I’ve only recently come into owning an iPad and being able to take advantage of some of these great pieces of software. Finally, if there has been a constant theme among all of the above pieces of advice it is this: equip yourself with the gear that suits your needs and get to know that gear intimately enough that you won’t feel the need to immediately move onto other synthesizers, for the more time you spend buying and selling your gear and setting and resetting your studio the less time you’ll have to jam and create the music you love among the instruments you value so dearly. Exploring the landscape of sounds and trying out new instruments and production techniques is all part of the journey, don’t feel like you can’t follow those pursuits lest you lose valuable productivity in the studio. But time is a limited resource that we all hold dear and thus it must be rationed accordingly. The more time spent thinking about a pursuit means less time spent actually pursuing that objective. This of course holds true for anything, but if you’ve made it to the end of this and other articles regarding buying a synthesizer then chances are you’re really looking to get into making music and playing around with these fascinating instruments. It’s good that you’re putting in the legwork to make a fully informed decision, but if you feel confident that this is a path you want to follow then I would encourage you to get involved sooner rather than later. Your time is essential and valuable and it should be spent on doing what you love, if electronic music is that thing then make sure you apply your time to actually creating that product. The more time spent making purchases or building up your studio only to tear it down in a few weeks so you can wire something differently means less time spent making actual music and exploring your instruments. These projects will be inevitable with any hobby or project worth pursuing, but the message here is simple: get started now instead of kicking the can down the road. You’ll thank yourself when you look back on your experience years from now instead of regretting what could have been. There is no better time than right now to start pursuing your ambitions.